No yard or garden would be efficiently watered without the use of a garden hose, and finding the right quality, size, and type of hose is essential to making sure it meets your needs. Because not all garden hoses are created equal, choosing the right one can seem like tedious task. Comparaboo understands your frustration and we have put together this complete garden house buying guide to ensure you find the right garden hose. 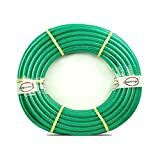 Sprinkler Garden Hoses: Sprinkler hoses are made to be used on the ground or lawn and include tiny holes on one side that sprays misty water upwards. 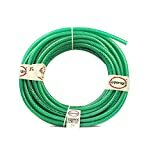 Great for garden irrigation, sprinkler hoses will make sure your garden gets the gentle spray it needs. Soaker Garden Hoses: If you are looking for a garden hose that can be buried under mulch, then porous soaker garden hoses are what you need. As the name suggests, these hoses soak flowerbeds and gardens by intentionally leaking water directly into the ground. Flat Garden Hoses: Flat hoses take up a lot less space and are much easier to store. Designed to lie flat unless water is running through, in which case it takes on a rounded shape from the pressure, these garden hoses are a convenient option for home gardening. Commercial Hoses: These often 100+ feet hoses are specifically designed for heavy duty, continuous use. With many of them able to handle warm water temperatures as well, they make for a durable hose choice for those big industrial jobs. Durability: Hoses that can stand the test of time and prove to have longer life spans are appreciated by owners and therefore get much higher reviews. 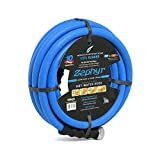 This doesn’t only apply to the hose build and its ability to keep its elasticity, but also the connectors of the hose. 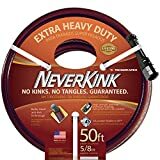 Kinks: Kinks are a top reviewing and commenting factor by garden hose owners, and hoses that don’t kink at all are real crowd pleasers. Garden hoses that do, however, are not rated well by their owners who state that these hoses are a cause of much hassle. 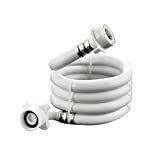 Weight: Garden hoses that are lightweight offer users much easier handling and are reviewed much better by their owners. Flat hoses that shrink to their original size after use are particularly favored in this regard. 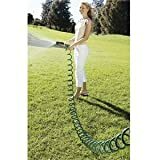 How long do you need your garden hose to be? It is important to note that the longer your garden hose is, the less intense the water pressure will be, so when choosing the length, try to choose a length you would need more often. Hoses range from 25 to 100 feet in length but it is also possible to join two smaller hoses together for those hard to reach places. Garden hoses come with either metal or plastic fittings (or couplings). Plastic fittings offer easy tightening and require a lot less hassle when attaching, while metal fittings (often brass) are the most durable option. Garden hoses are available in a variety of materials and choosing between them will be based on how much you want to spend, how durable you want your hose to be, and how lightweight you need it to be. The most budget friendly and lightweight hoses are normally made from vinyl or vinyl reinforced material. For maximum durability, choose a rubber or rubber reinforced hose. For the most flexible, easy to store option, plastic hoses are best suited. The bigger the diameter of a hose, the more water will be distributed per session. Garden hoses have diameters as small as ⅜ of an inch to ¾ of an inch. The standard size in the US is normally ⅝ of an inch and is an ideal thickness for home gardening and watering. The more layers (or plies) a garden hose has, the more durable and strong your new garden hose will be. Garden hoses vary from one to six plies, with one being the least durable and six being the strongest option. 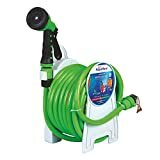 Garden hoses need to include a nozzle for water distribution and these come in a variety of models to suit your gardening needs. Jet spray nozzles are an efficient choice for cleaning. Pistol and twist nozzles offer the most adjustment options. And for your more delicate flowers, fan spray nozzles will be your best choice. Considered a must-have garden hose accessory, hose reel offers easy storage and hose protection. There are a variety of shapes and styles to suit any need and taste. Some garden hose additional features worth considering are: antimicrobial protection, which will prevent bacterial growth and keep water safe to drink; a hose saver, which is a wire reinforced section of the hose that helps protect the hose from damage when being pulled; and a garden hose that comes with beveled fittings that are easier to tighten and loosen. Scotts: Scotts is one of many quality garden hose brands that is manufactured by Swan, who produces a wide variety of hoses from light duty to industrial. Legacy: Legacy has been manufacturing quality, long lasting garden, automotive, and industrial equipment since 1986. Tuff-Guard : A quality garden hose brand, Tuff-Guard is a brand of JGB Enterprises, Inc which was formed in 1977.